2017 is just around the corner, and we all know what that means – time for a new slew of New Year’s Resolutions to break! No, we’re kidding. Because in Vancouver, it’s so easy to win at resolutions we don’t even bother making them. We just tackle ‘em year-round (our temperate year-round weather helps)! Make like the locals and join us at the following #VeryVancouver activities. In summer, Vancouverites swarm to the Grouse Grind in droves. A gruelling yet gorgeous hike through Grouse Mountain’s forested woodland (3.7 metres straight up – no wonder the Grind is also known as “Mother Nature’s Stairmaster”), the only tougher challenge is the Snowshoe Grind. 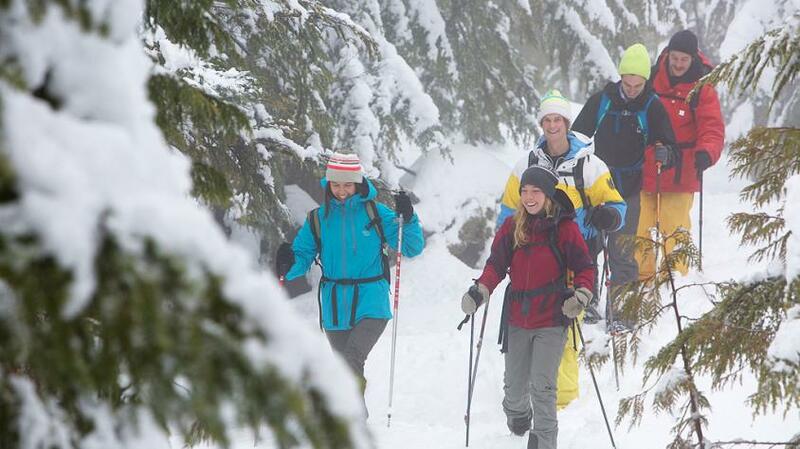 Located mountaintop, the Snowshoe Grind is the perfect way to start Grouse Grind hiking season fit and strong, while embracing a snowy winter landscape. Don snowshoes outside the Chalet and plunge into the wild, traversing 4.3 km of wintry alpine terrain. Your reward? A piping hot apple cider back at the Chalet (not to mention buns of steel). You’ll emerge feeling refreshed, rejuvenated and ready to tackle Everest next. Join more than 2,600 daredevils as they brave the freezing waters of the Pacific Ocean on January 1. The annual Polar Bear Swim is a cold-water plunge that takes place on the first afternoon of the new year – but it’s all in good fun (costumes are encouraged). Ultra-bravehearts can enter the 100-yard race, though it’s best not to stay in longer than 15 minutes. All registrants will walk away with fully earned bragging rights, a nifty pin, and a new lease on life… because if you can dip into frigid ocean waters on a winter day, you can do anything. Missed the race? Explore a whole new world with Sea Dragon Charters’ scuba diving adventures. Zip into a warm jacket and take a spin on a Stanley Park cycling tour with Cycle City Tours. Bike is the best way to explore this forested winter wonderland: in winter, the trails are nice and hard, and biking is the perfect way to warm up while getting the blood pumping. You’ll stop in the heart of the 404-hectare park at tranquil Beaver Lake, learn about traditional First Nations culture at the totem pole forest (photo opp alert! Also, the café here offers unbeatable hot chocolate) and experience a gasp-inducing transition as you cross between the buzzing, beach-adjacent children’s waterpark into the sudden stillness and solitude of lush green forest. Resolution: Hit the slopes (finally). Dust off your skis and take advantage of fresh, Coast Mountain powder at the Sea to Sky Gondola, located a 40-minute drive from Vancouver in the town of Squamish. Towering, snow-capped peaks, crisp mountain air and pristine snow make for the perfect seasonal adventure for skiers, tubers, snowboarders, toboggan’ers and all the other winter ‘ers. After an invigorating day of fitness and fun, retreat to the cozy lodge for a hot beverage and sweeping views of the surrounding granite monoliths, sub-alpine meadows and sprawling waters. Resolution: Find your zen, bliss out and harden your core at a yoga class. In their spare time, Vancouverites love to bend into pretzels alongside fellow yogis – okay, some of us are more pretzel-y than others. Regardless, it’s easy to find a class in the city considering there are more than 1,500 on offer every week, ranging from stand-up paddleboard yoga to hammock yoga to laughter yoga (tip: don Vancouver-born lululemon yogawear pre-class for instant confidence and inspiration). Classes are offered at yoga studios in nearly every neighbourhood; in hotels (for example, the Shangri-La Hotel offers private classes upon request, and every guestroom in The Loden includes yoga mats and a 24-hour yoga channel with additional props, magazines and yogi tea in select rooms); and at events like the annual SeaWheeze Half-Marathon.